Ironwood Electronics offers high performance test sockets and adapters for both engineering and production use. 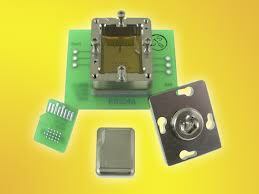 Adpaters for IC packages include QFN, BGA, SOIC, QFP, and other SMT packages. Released this year is their new “Low Cost Stamped Pin Socket” for Burn-in and Test Socket applications. Their GHz line of spring-pin and elastomer sockets provide socketing for almost all packages in BGA and QFN as well as up to 40 GHz bandwidth. Ironwood Electronics sockets boast the smallest footprint in the industry.The high-bandwidth sockets will accommodate fine package dimensions, with pitches as small as 0.3 mm. We also like the company “ANDK” for the variety of different sockets they have available, the quality of the adapters / mechanics, the great price and quick-ship availability on Amazon. Below we highlight some of the more common socket, and you can click here to view the complete line-up of sockets for QFP, QFN, SOP, eMMC, Crystals, etc. You can find adapter sockets for SOP, TSOP, SOT, QFN, and BGA; as well as eMCP, eMMC and Data Recovery Tools, and Crystal Oscillator Sockets for nearly all of the most common formats and pin counts. These will speed up your design and development, making it easier to prototype your hardware. Especially if you have surface mount chips or need to program Flash or Micros. Ironwood Electronics also provides customized adapters to the semiconductor industry for those systems requiring intricate SMT interfaces for emulation, test, and prototype functions. In addition to high speed test sockets, Ironwood Electronics has been a leader in low and high volume turn-key adapters, including IC probing and package conversion solutions for over 20 years. Their facility is ISO-9001:2008 approved with mechanical and electrical engineering staff and develops hundreds of custom sockets and adapters every year for the semiconductor industry. They specialize in quick turn, high quality, well designed adapters and sockets.